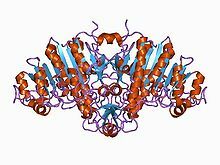 Reebin diagram (rainbow-color, N-terminus = blue, C-terminus = reid) of the dimeric structur o bacterial alkaline phosphatase. 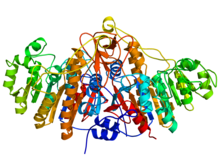 Alkaline phosphatase (ALP, ALKP, ALPase, Alk Phos) (EC 3.1.3.1) or basic phosphatase is a homodimeric protein enzyme o 86 kilodaltons, conteenin twa zinc atoms crucial tae its catalytic function per monomer, an is optimally active at alkaline pH environs. ↑ 1.0 1.1 PDB: 1ALK : Kim EE, Wyckoff HW (March 1991). "Reaction mechanism of alkaline phosphatase based on crystal structures. Two-metal ion catalysis". J. Mol. Biol. 218 (2): 449–64. doi:10.1016/0022-2836(91)90724-K. PMID 2010919. ↑ Tamás L, Huttová J, Mistrk I, Kogan G (2002). "Eﬀect of Carboxymethyl Chitin-Glucan on the Activity of Some Hydrolytic Enzymes in Maize Plants" (PDF). Chem. Pap. 56 (5): 326–329. ↑ Ninfa; Ballou; Benore (2010). Biochemistry and Biotechnology. USA: John Wiley & Sons, INC. pp. 229–230. ISBN 978-0-470-08766-4. This page wis last eeditit on 22 August 2017, at 21:28.